It's that time of year again, if you live in South East Asia. The dry season is upon us. The air has become hot and still, and the fires rage all around. "Rage" may give the erroneous impression of wild flames extending into the sky as far as the eye can see. It's not quite like that. On some days you can't see much of anything for all the smoke that is in the air. The photograph to the left was taken on March 5, 2010. Each red area is a fire at least 50 square meters in size. Chiang Mai is roughly a third down from the top and just right of center, well surrounded by fires in Norhern Thailand, Burma and Lao, on that day. 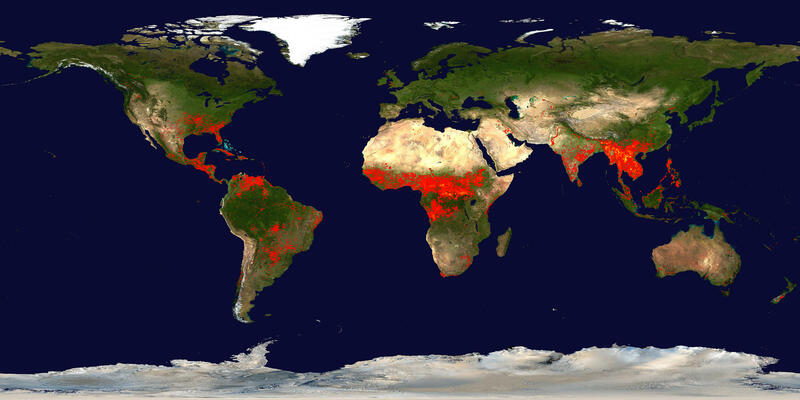 This world fire map (large image, may load slowly) plots fires over the 10 day period, March 3, 2010 to March 11, 2010. From it, you can see that during this time of year, you would find yourself surrounded by fire most anywhere in South-East Asia. The Pollution Control Department in Thailand has a collection of air quality sensors around the country to monitor the effects of burning, amongst other things. There are three of these sensors in Chiang Mai. Data is made available on their web site. The provided tables, maps, and graphs are useful for looking at up to date information, geographical variation, and recent trends. In order to facilitate looking at longer range characteristics they've also made the sensor data queryable. The google timeline chart below was easily created by submitting a query that returned the full series of data, copying it into a google spreadsheet, and adding the google timeseries chart gadget to visualize it. The two values in the chart are pm10: 10 micron particulate matter, and AQI: Air Quality Index. They are taken from the Chiang Mai sensor with the longest history. The data in the chart spans from June 1, 1998 until March, 17, 2010. However, the first six years do have sizable gaps in continuity. It's a nice chart. It shows that there is a yearly spike in air pollution. You can see that there is some gaps in the data (the flat angled sections). And its apparent that something was quite different in 1999, than it is now. Though, beyond these few points it's cumbersome to identify any other macro-characteristics across the data range. There is too much detail - too much data, and not enough information. The data that is least interesting over the long term is variations within safe levels. By removing that data, we're left with only the data points for days in which the air pollution was in excess of safe levels. It's a sizably reduced set of data that I've visualized with the excess chart in the first tab. In order to disregard the variations in safe pollution levels, its necessary to define a safe limit. The PM10 and AQI air quality metrics are well standardised and agreed upon. But their interpretation is sometimes contentious. The Thai Pollution Control Department specifies that a pm10 in excess of 120 μg/m³ is unsafe. While, in the United States the pm10 standard is set at 150 μg/m³, and in Europe at 50 μg/m³. Disagreement over the safe AQI value generally revolves around wether the values between 50 and 100 are acceptable. This range is labeled 'moderate' in the index description. For this reason the excess chart allows the user to select the safe level for either metric themselves. The excess chart displays data points in excess of a safe limit for a given range of data. The height of each column represents the number of days in a year, in which the selected metric was over the safe limit. The width of the column represents how much in excess of the safe limit the AQI or pm10 was on that day. The varying colors of each column denote in which month each excessive day occurred. The numbers surrounding each column summarise these same characteristics. AQI data for the year 2007 is displayed in the example to the right. The safe limit is set at 75. The bottom right corner shows that data was collected for 94% of the days in the year (about 343 days). The numbers on the top of the column show that 18% of the days in the year had an AQI in excess of 75, and on those days the AQI was in excess of the safe limit by an average of 34%. The three dominant colors show that most of those days occurred in February, March, and April, with the worst days being in March. Note, that the percentage of days in excess of the safe limit is calculated for 365 days in a year, not the number of days for which data was collected. What's gathered here is only two metrics worth of historical data from a single sensor, and an image of regional fires on a single day. I think its a useful outlay of information for gaining a surface understanding of how the burning season affects the South-East Asian region and Chiang mai, Thailand specifically. But, there are many things left out for the sake of brevity. I'd like to be able to put something more descriptive together at a later date.